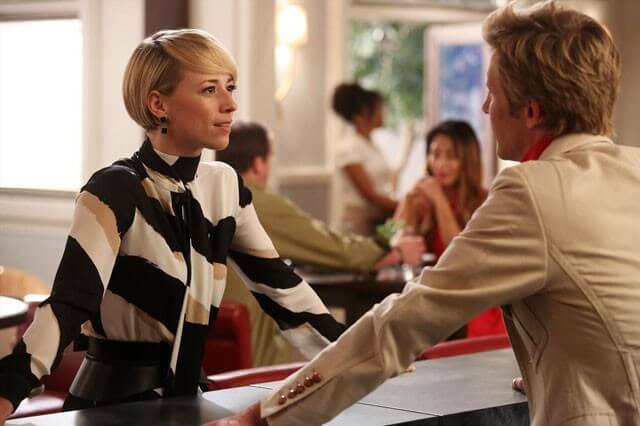 Karine Vanasse has been stirring things up on ABC’s Revenge for two seasons as Margaux LeMarchal, and playing a strong character who demands to have her input paid attention to has been a refreshing change for the Canadian actress. Vanasse took part in the TCA winter press day for the popular TV show and I had the chance to sit down with her briefly to discuss her work on the series. – Warning: Make sure you’re caught up on season four before reading any further. There is a major spoiler in this Q&A that has to do with the mid-season finale, “Atonement,” which aired on December 7, 2014. You’ve been warned. How do you feel about this season thus far? Moving forward characters will want revenge for new things. You know what they say about revenge is that you should dig two graves. Is that coming true for Emily? Is there anyone on the cast who you are particularly close to? Were you following Revenge before you got the part? What were they originally able to tell you about Margaux when you first got the part. How has the fan reaction been to Margaux? Is it fun to be the character who stirs things up and who some viewers see as bad? What’s been particularly fun for you?